We are excited to announce NC in Focus, a new blog series that will appear on Thursdays. These posts will highlight North Carolina data in relation to current discussions about population trends at the national level. NC in Focus will consist primarily of a graph or chart with one or two sentences of explanation and links to the original articles that inspired our look into NC data. Nationally, teen births have fallen 52% from their high in 1991, with more rapid declines in the past 5 years. 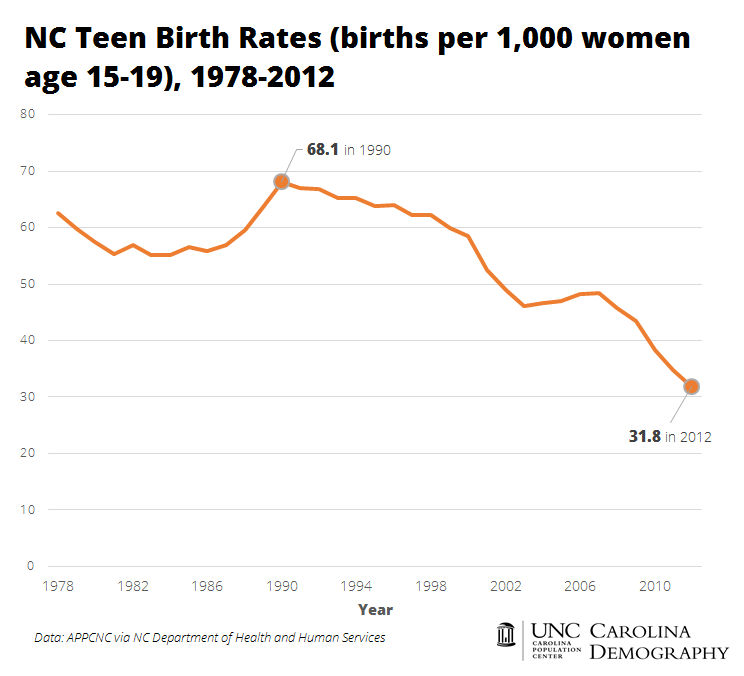 North Carolina teen birth rates mirror national trends. Teen births are down 53% from 1990, with a substantial drop post-2008. This entry was posted in Health & Environment and tagged birth rates, teen pregnancy. Bookmark the permalink.